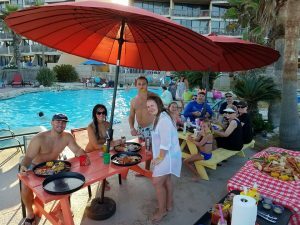 Backyard Boil – Rollin Tide Boil Co. Note: A quote including basic pricing, event details, and upgrade options will be emailed once your specific information below is completed. Once you have reviewed your quote, call us at (361)416-0416 to make any changes, add upgrades, or simply to book your event. ** Please note: Bookings will NOT be finalized without speaking to one of our Booking Agents at the phone number above. Bookings via Voicemail messages or Email are NOT allowed. To complete your reservation, you MUST speak to us via phone AND we must receive your 50% deposit. Where are you staying, if vacationing? 6:30 p.m7:00 p.m.7:30 p.m.8:00 p.m .
Any special instructions or questions? Is this a special occasion? (Birthday, Anniversary, etc. )?